Some times ya gotta go all out. That’s what I do, when I find out a senior is into sports. There’s a lighting setup for sports photography that has been developed by commercial photographers who shoot for ESPN, Sports Illustrated, Nike, etc. that makes an athlete look awesome. They come across strong, confident, forceful, larger than life. There’s just one problem. This lighting setup is complex, requiring at least four powerful studio strobes and nearly two hours of setup on location. But I’m all in. The time doesn’t matter. I want to create amazing images. Like this image of Nathan. When we came to the part of the shoot when we were doing the sports shots, and I showed him the back of the camera when I took this image. he was stoked. He couldn’t believe how great he l0oked in the shot. Which made all the effort worthwhile. He and his family not only got this image, but many others from the same set, because they all looked so good. Now that’s the way to go! 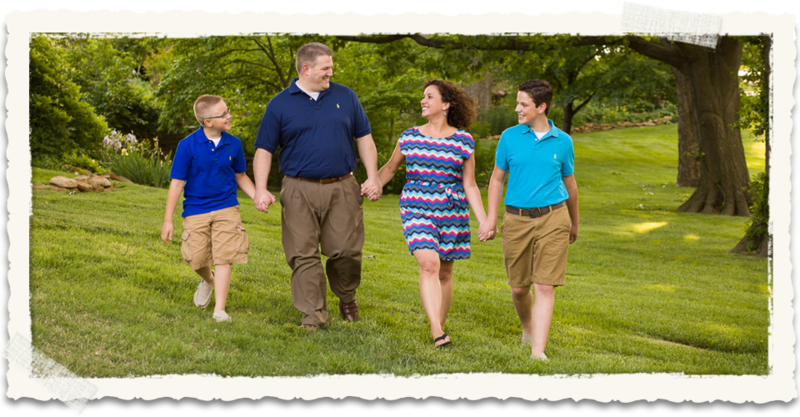 When the Bunten family arrived at my studio estate for their portraits, and stepped out of their vehicle, the moment I saw their clothing, my heart leapt for joy. Their outfits were perfect. In fact, they won my “Best Dressed Award” for the season. Look carefully at their portrait: the colors in the Mom’s top are perfectly matched in her family’s clothing. The light blue on her son, the coral on her daughter, the mint green on her husband: all of these colors are in her top. Because of this, her family’s portrait has a strong sense of distinct individuality within a bond of harmonious unity. Not only that, but everyone in the portrait is wearing at least short sleeves (Mom is wearing three-quarter sleeves–smart move!) This insures that the viewer of the portrait will have their eyes drawn more to their faces, and not to skin tones on their arms. Finally, everyone in the portrait is wearing long pants. The day of their portrait was warm, and the Bunten’s may have been tempted to wear shorts, but doing so would have greatly reduced my options in terms of how I could have posed them (imagine the son and daughter in this pose wearing shorts–not appropriate!) Also, wearing shorts would have drawn a viewer of this portrait away from the faces and towards the skin tones on the legs. 1) No one should be wearing white! Wearing white will make that person stick out and make them look heavier. Don’t believe me? 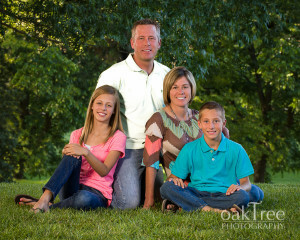 Look at the modified image of the Bunten family, where I have made the husband’s shirt look white. Doesn’t he stick out? Doesn’t he look heavier? Everyone in the family should be wearing some form of color that goes together harmoniously—no one should wear white! 3) No member of the family should wear shorts, no matter how warm it is outside. Family members wearing shorts limit my options on how I can pose them, especially when the shorts are cut with very wide leg openings like they usually are. In addition, any skin tones visible on the legs will distract the eye from the faces when the portrait is viewed. It’s much better for everyone to wear some form of long pants! As a portrait photographer, there are so many variables to respond to when we are outside: the wind and the weather; the current condition of my studio estate; the time of day and the position of the sun; not to mention the family and their personalities and behaviors. When it comes to how your family is dressed for the portrait, I will photograph you however you are dressed when you arrive. But please, please, know that the portraits will look so much better if you listen to my rant, pay attention to the guidelines, and make the effort to dress your family appropriately. Then maybe your family can be the next winner of the “Best Dressed Award”! Portrait photography can feel like a balancing act, between on the one hand creating a wide variety of images quickly and efficiently, and on the other hand, coming up with that custom, exquisitely crafted portrait that emerges only as much time is expended. As it turns out, photographers end up doing both, since fast paced and slow paced shooting both create their own unique look. In the case of this senior portrait of Emma, the slow, time intensive approach was taken. There was so much that needed to be done outside of the frame of this portrait to make the portrait what it turned out to be. Off to the right, the sun was setting, blasting the area of the portrait with harsh, unflattering light. So we put up a 6’x10′ scrim to soften the light, and when that turned out not to give enough coverage, we clamped a white, king-sized bed sheet to a low hanging tree branch. The light that this provided was too flat, so we set up a portable strobe with a soft box to the left, in order to create wonderful light on the face. Since it had rained the night before, the patio needed to be raked clean of blown down leaves, and then thoroughly swept so the puddled water would dry. Multiple cluttering distractions, including an ugly ground pipe coming off of a downspout, needed to be removed from the background. A selection of potted plants was artfully arranged to balance the composition. All in all, two hours of setup went into preparing for this single portrait. Now, the portrait itself didn’t take that long—once Emma arrived, the portrait in this location took no more than ten minutes. Which is good, since it was hot on that patio–the stone had absorbed the heat of the afternoon summer sun, and it was well above 90º when the portrait was taken. But the final effect is simply lovely—a classic summertime portrait with a breezy, yet timeless feel that will still look great fifty years from now. Which is good, since Emma and her mother chose this image as their wall portrait, to be displayed prominently in their home! Sometimes a little thing goes a long way. In the world of art, there is a concept called “color harmony”. Colors that stand in certain relationships to one another are seen as creating specific effects. For example, colors that are similar to one another are seen as restful, while colors that are different from one another are seen as active. How, do you ask, does this apply to portrait photography? Well, one way of insuring that a person’s face will stand out in a portrait is to place them in front of a background that is similar in color to their clothing. That way, the colors of the clothing and the background become less active, while the colors of the person’s skin tones, which are different from the clothing and background color, become more active and thus stand out. Notice the beautiful portrait to the right. Even though red is a strong color, because both the dress and the background are red, their color becomes more restful, supporting and contrasting with the facial skin tones and hair color, which stand out even more vibrantly. 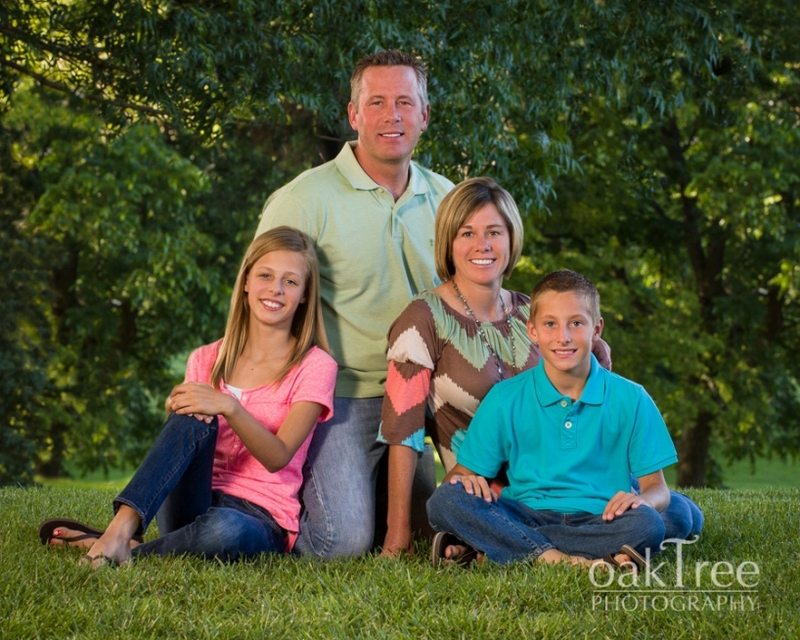 At Oak Tree Photography, we do the big things to make your portraits wonderful, but then we do the little things that take them to an even higher level! 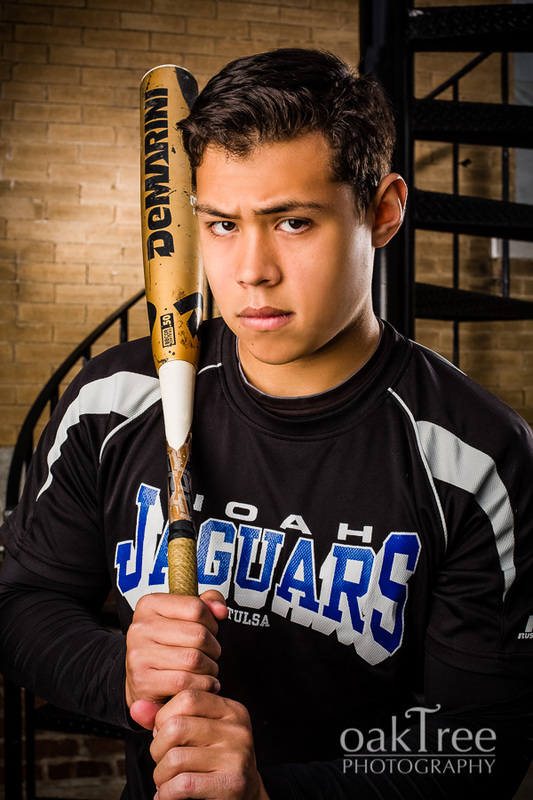 I love senior portraits. I pull out all the stops and create portraits that stand the test of time. Whether it’s a boy or a girl, I enjoy the process immensely. But, I admit—I have a special place in my heart for portraits of senior boys. This is because, in contrast to senior girls, few senior boys are motivated to have their pictures taken. While many senior girls dream for years about being “a fashion model for a day”, a lot of guys say, “Oh, Mom, do I have to?” For that reason, some senior boys never get their pictures taken at all. Which is sadder than sad, because then, in years to come, there will be no portrait of them in the prime of life. So, I love working with Moms in motivating their son. And I love working with the senior himself, to win him over, taking a wide variety of portraits, including ones even he thinks are cool. Now, this doesn’t mean that all senior boys are resistant to portraits, oh no, that is far from true. Consider Matt, whose portrait accompanies this post. Matt not only is handsome, and personable, but he was eager and involved. And so his images turned out fine. But, even if he hadn’t been all that motivated, his images would still have turned out great. I am so committed to senior portraits for boys, and I have learned so many ways to reach them, that it never fails for the portraits to turn out to be everything the family had hoped for, and more!